Many of us have probably asked a similar question. What about me? Who doesn’t love little children with all their precious innocence and charm? But what about those of us that may not feel as lovable; those of us who may have struggled and lost our way, or who have wandered paths that have left us worn and doubting our worth? The young man in the painting is dressed in dark clothing representing those dark clouds that at times weigh heavy on our souls and seems to cover the light that still shimmers inside us. The knapsack and bedroll remind us of the worldly burdens that we all carry around … fear, discouragement, pain, loneliness, sorrow, anger, hopelessness and on and on. The meandering path in the background symbolizes the twists and turns of life’s journey, some of which stretch us to our limit. Thankfully, Christ’s love carries no conditions and is extended in full measure, especially to those who feel lost and forgotten. Wherever we are in our journey, the Lord is near. He will not force himself upon us, but simply waits for us to ask for his help. Unlike most of us, who have difficulty seeing beyond the outward view of that person on the bench, Christ sees the soul, knows the heart and remains the ultimate Savior and friend. 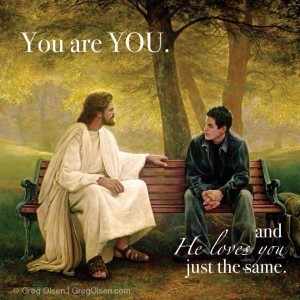 You are YOU, and He loves you just the same. How about one with an elderly person with no family of her own who would have her back and is isolated and lonely? Its extremely important to remember that JESUS is the son of JEHOVAH. Because of his life, death and ressurection, we, as his joint heirs have the PROMISE of eternal life. But we must remember that there is such a thing as right and wrong. We must remember that in the garden of eden , man had a choice, all thru all history man has a choice. Do not let your hearts be blinded by prosperity preachers who preach that GOD is ONLY LOVE AND UNENDING FORGIVENESS. Right is right, and wrong is wrong.YHVH is the FATHER of our lord and savior JESUS CHRIST.. the Holy ghost is a gift from YEHOSHUA(JESUS) and the devils even believe, and tremble.WHO ARE WE TO CHANGE HIS WORD AND NOT TREMBLE???M!?!! Joshua Jesus came to rescue the sinners who would chose to follow him. Greg’s picture and words here are saying he loves all and died for all. At some point we are all unlovable (personally I find your attitude unlovable)! Our Heavenly Father and our Saviour are waiting for us to change our attitudes and stop being judgemental (yes I’m working hard at not being judgemental as I don’t want to be like the Pharisees and Saducees and join the holier than thou brigade) I’m trying to love the sinner but not the sin. And by loving the sinner we can help them to regain the right path. If we stand around preaching they stop listening. Remember he who was without sin wouldn’t throw any stones. I have loved this painting since I first saw it. Our three sons are not active and even though they are not teenagers anymore, this still represents what we pray will happen some day. I have said nothing to any of them but they all know why I have it hanging on our bedroom wall. Thanks Greg. Beautiful picture, beautiful commentary! I have a daughter that could be setting where this young gentleman is. I hope this young man remembered his way. Stumbled upon an image from your site, while exploring ideas for possible book covers for my client, Joan Arnsteen. We were wondering what it would entail to garner possible use of an illustration for her latest book, Socrates, Jesus and Freedom which I am editing, designing and publishing. I’ve always wondered what about this painting mesmerised me and spoke out to me.Its amazing how merely an image can lead to a whirlpool of thoughts. Baffled at the effect it had on me I decided to look into the painter and this one painting and did my homework. And thats how i stumbled upon LOST AND FOUND.What he represented, who he represented became the inspiration. Depicting the Endless Unexplainable Love of Christ , and Life worthy of his Calling , with the magic of images and colours became the inspiration. On a daily basis we come across innumerable pictures of Christ with children, rarely do we find images of young men and women finding him. Finding true love, unselfish unconditional love. Mostly because they feel lost and don’t think anybody could reach out to them beyond all that hurt, humiliation, tears ,remorse ,regret, feeling of having lost opportunities. Nothing to reach out to. And that exactly what this picture depicts, the young man with all that baggage. He just needed a moment with that amazing man. The man who would change his life forever. Who was ready to carry it all for him. Who bore it all and paid the price ages back at the cross. So he dint need to carry all that needless pain and sorrow. Not for a moment…..Not for a moment will he forsake us..the journey might feel lonesome and weary and sometimes at the end of it we wonder how we made it through. It was him all the while. I feel the painting was aptly named LOST AND FOUND cause sometimes it’s about getting that second chance in life, finding that lost opportunity. You wonder if it could be the same ….. Well, he says you can. His gift is the present. This time.NOW is what u have. Use the time he’s given you now and don’t lose out on life anymore. So grasp it and hold his hands. Trust him to lead u into that peaceful future you never dreamed of and take you places u never dreamed of. It might not always what you planned for but you can trust him it would be perfect for you.It might not be all rosy and easy but we can be assured he’s holding on and will never leave. A friend who will never give up on us. No matter what…And to think a painting cud be so thought provoking. Life does imitate art after all…. I have heard rumors about the model for this painting. Is there anything you can tell me about him and his future following the painting?